I Won My First Guaranteed Prize Pool Freebie Game In DraftDay! 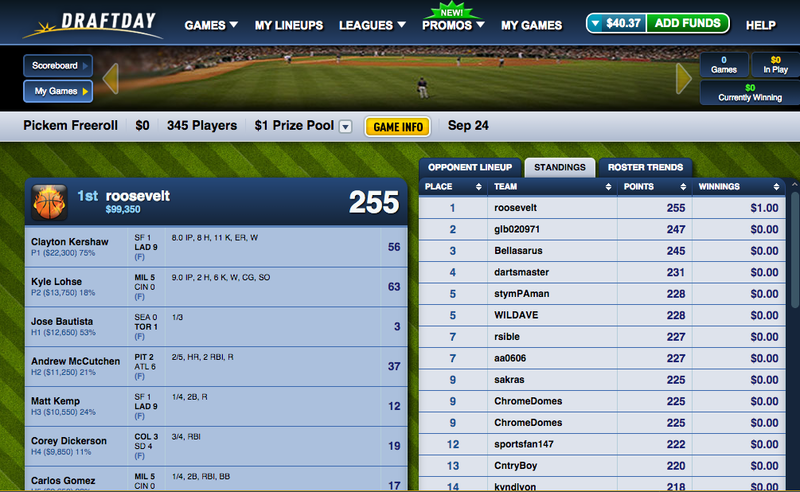 So I’ve been playing daily fantasy baseball for about three weeks now. The first two weeks I spent learning and understanding the game and figuring out my strategy. I finally finalized my strategy and daily research routine towards the end of last week. So this week is my first week fully utilizing my daily research routine. 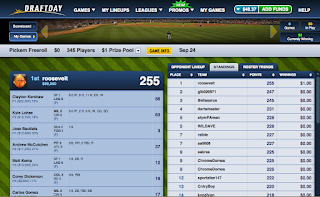 Last night, I achieved my first MAJOR milestone in my journey to become a fantasy sports professional. You can make OK money grinding it out playing head to head and 50/50 matchups. These are games where you basically have a 50% chance of winning. However, the best you can do in these types of matchups is win an additional 80 cents for every $1.00 you pay towards an entry fee. If you want to make the BIG money however, you are going to have to win what are known as Guaranteed Prize Pools! Basically, with these pools, you compete against dozens, hundreds, in some cases even thousands of other players. The top players in the matchup win the cash prizes in the pool. These pools have prizes of hundreds of dollars, thousands of dollars, tens of thousands of dollars, even HUNDREDS of thousands of dollars. Most players who make a six or seven figure income playing fantasy sports win guaranteed prize pools. So last night I entered a freebie guaranteed prize pool. Here’s a VERY important tip for you. Write this down. ALWAYS ENTER ALL FREEBIE MATCHUPS EVERY SINGLE DAY!!!! A freebie matchup is a match where there is NO ENTRY FEE! That means it costs you NOTHING in dollars to enter this matchup. However, despite the fact that it is free, there is still a prize for the winner. Some of them have really small prizes. Sometimes they might have a larger prize. However, there is nothing to lose and everything to gain by entering a freebie matchup. So the one I entered last night, the prize was only $1. I competed against 345 other players. Only the person who finishes first place wins the $1. Everybody else gets nothing. In this particular game, each player is allowed to enter up to THREE teams. So I entered my three teams. That brings up ANOTHER very important tip. Write this down. ALWAYS ENTER THE MAXIMUM AMOUNT OF TEAMS ALLOWED FOR FREEBIE GAMES! If the freebie game allows you to enter up to 3 teams, make sure you enter 3 teams. All this does is increases your odds of winning. So I entered three teams into this particular matchup. All three of my teams did very well. My second team finished 15th out of 345, which is incredible! My third team finished NUMBER ONE OUT OF 345!!!! I WON THE GUARANTEED PRIZE POOL!!! This is huge because in only my third week playing, I was able to get a first place finish and win a prize pool beating out all of the other teams that were competing against me. This is a HUGE accomplishment for someone just getting started. There are people who have been playing this game for MONTHS or even YEARS and have never won first place in a prize pool before. It is very important that you have a research routine and that you maximize the opportunities that are available to you. Doing so will help you to maximize your wins and minimize your losses in fantasy sports! My Fantasy Sports Professional Debut! 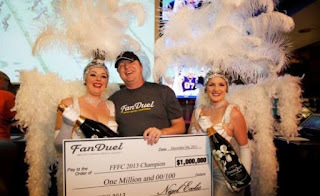 Travis Spieth, Winner of One Million Dollar Prize From FanDuel Fantasy Football! So today is the day I make my big debut onto the Fantasy Sports Professional scene! Could I be the next Travis Spieth and win a million dollars??? Anyway, since this is my first week, I thought it would be a good time for me to share some of the insights that I have learned to prepare for playing fantasy football. To make enough money to earn a living playing fantasy sports, you really need to utilize daily fantasy sports leagues. Traditional leagues are for an entire season. However, your chances of winning are much less, and you would either have to enter an unmanageable number of leagues or compete in very high stakes leagues. With daily fantasy sports leagues, you can play every day. There are thousands of games at all different levels from free entries to thousands of dollars in entry fees. My approach is going to be to play football on Sunday and play Baseball during the rest of the week. 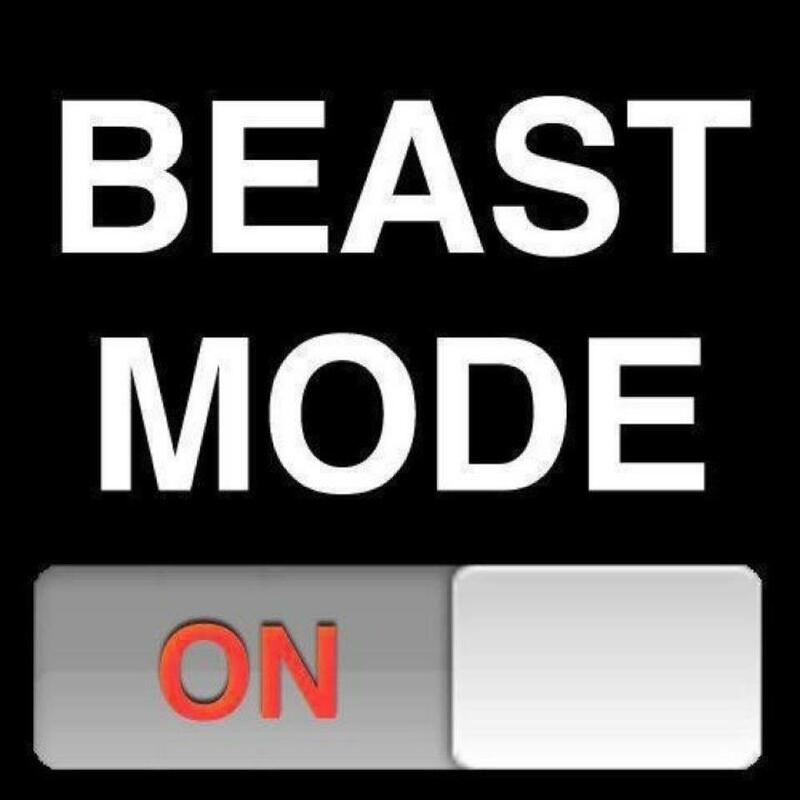 Once baseball season is over, I will transition to basketball and play basketball along with football. To get started you can either play completely for free and utilize free rolls to build your bank roll. Or you can make a deposit and utilize your deposit money to play. I started out by making a $35 deposit. Next, you want to have a budget. Otherwise you could lose your entire deposit if you aren’t careful. To begin I am going to only utilize 10% of my total available bank roll per day. By utilizing only 10% that means I could lose every game up to 10 times before I have to deposit more money. With a $35 deposit, that allows me to play in up to 4 games at $1 each. I rounded up since 10% of $35 is $3.50. I can also play in any free games that are available. Football has 2 free games available this week. The first step is to decide what type of competition you are going to play in. There are three main types of competitions. The first type is head to head. You play against one other player. Whoever wins receives the cash price. Loser receives nothing. The second type is 50/50. You compete against a number of players. All of the players that finish in the top half splits the cash price evenly. All of the players that finish in the bottom half receive nothing. There is a variance of this game where the top third splits the prize and the bottom two thirds receive nothing. The third type is tournament. In a tournament, a number of people enter. There is a top prize which consists of the largest amount of the prize money available. 2nd place gets a smaller prize, 3rd place even smaller and so on and so forth. So what is my strategy going in? One of my first strategies was to maximize the Free Rolls. A Free Roll is a tournament contest in which thousands of players participate. It cost nothing to enter and the top price is often significant. In the case of the one I’m in, the person who comes in first receives over $136. As long as I finish within the top 1000 or so, I will at least receive some money. 25 cents is the lowest cash price to be exact. It cost me nothing to enter the free rolls. However, here is how I maximize the free rolls. You are allowed to enter up to FOUR teams into this particular free roll I entered this Sunday. So I made sure I entered four teams. I also made four COMPLETELY different teams for this contest. This significantly increases my chances of winning because if my main team does bad, one of my other teams may do good. If all four of my teams do good, I could finish in the money four times and win four separate cash prizes! My second strategy is to only participate in head to head or 50/50 matches. Since I am just getting started, I want to maximize my chances of winning. Each of these contests, I have a 50% chance of becoming a winner. For these contests, I am using the same team for each one. The head to head matches have the least amount of variance. If my team is better than my opponent, I win, plain and simple. The 50/50 matches have a little bit more of a variance. This is because since I’m competing against more people, my team is more likely to either win most of my 50/50 matches or lose most of my 50/50 matches. So it’s a little more risk with a little more reward even though I still have a 50% chance of winning each contest. So that’s pretty much my approach. I feel very comfortable with the teams I submitted and I like my chances of winning this week! We’ll find out how I did soon enough! My name is Roosevelt Cooper and welcome to Fantasy Sports Professional! I designed this site with one purpose in mind. To help you earn a living from fantasy sports. On this website, you will get an inside look at my journey from Fantasy Sports newbie to Fantasy Sports Professional! I will also share with you many of the insights that I am learning from the professionals who are already earning a living playing this game! Finally, in the future, there will be services available to you to help you to take your game to the next level. So, sit back, relax and enjoy the ride! This is going to be AMAZING! I’m excited that you are here to participate in this journey with me!